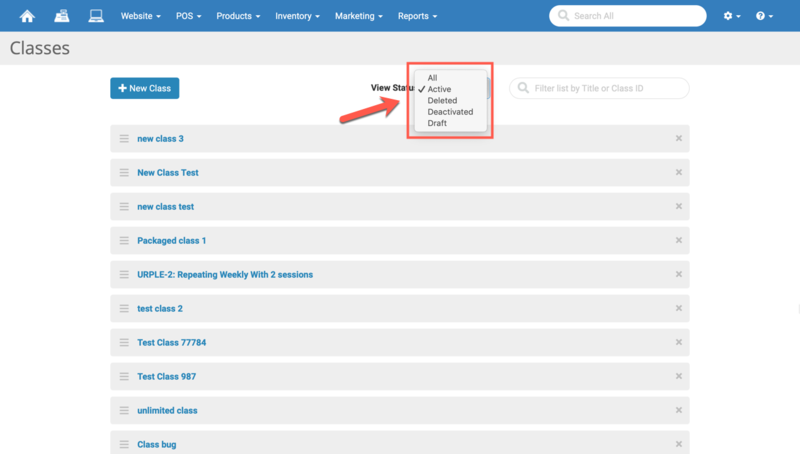 We have enhanced the Classes module to support all statuses, and not just the "Active" status. You may now save your classes in a Draft, Active, Deactivated, and Deleted states. Only classes with an "Active" status will appear on the website or in the register search. Classes that you have deleted you can now restore to an active state. Now that we are supporting more statuses for classes, we have added a filter on the Class List page to help with searching. A WalkMe step-by-step popup will now appear for new users who login so they can be easily guided to the basic training resources. The ability to fulfill web orders will be disabled for any orders that have been fully refunded. After selecting all items on a page, a message will display asking you if you would like to also select all items in the current search results, which can often span many pages. Previously, you had to click Select All a page at a time. When processing bulk changes for over 50 items, we will now display messaging about the status of the changes. Editing thousands of products can take more time, and seeing a status message will help ensure that the updates are processed successfully. Updated the global search located on the blue navigation bar, to pull up a transaction when you scan a transaction receipt. Fixed an issue where multiple Special Orders for the same product wouldn't be properly marked as being received if they existed within the same Purchase Order or Receiving Order. Fixed an issue where having "&" in the customer name caused the checkout process to fail. Fixed an issue where the "Availability" filter on the product list page wasn't working correctly. Fixed an issue where clearing assigned filters would not clear any "None Assigned" items. Fixed an issue where sometimes the web order notes icon would not show that there was a note on an order, even when there actually was. Fixed a bug in which the next payment date wouldn't set correctly if payments were collected up front.